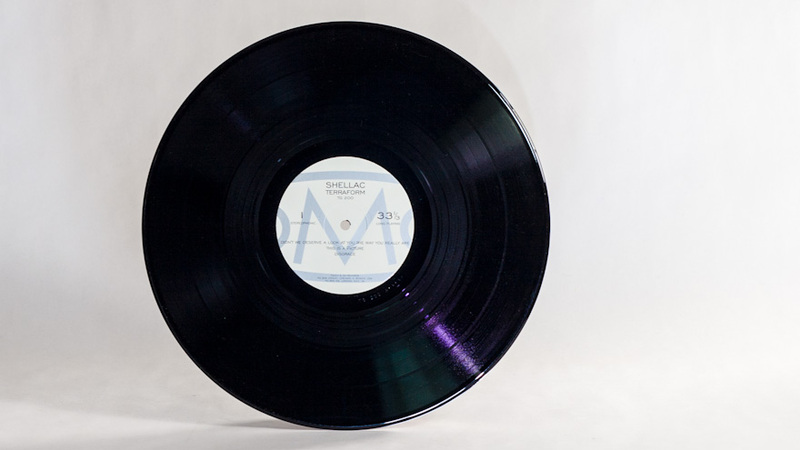 North America’s Shellac LP and CD release. 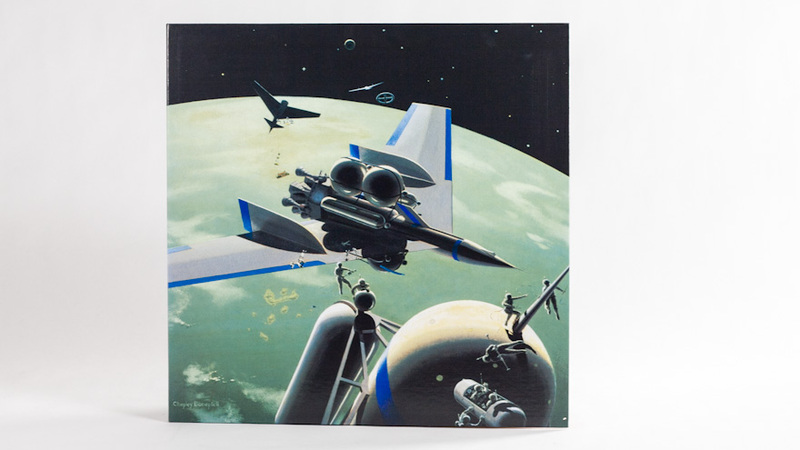 On the LP jacket two spot colors were used to increase the range and depth of the Chesley Bonestell illustrations. Spot matte and gloss varnishes were then used to texture the print. 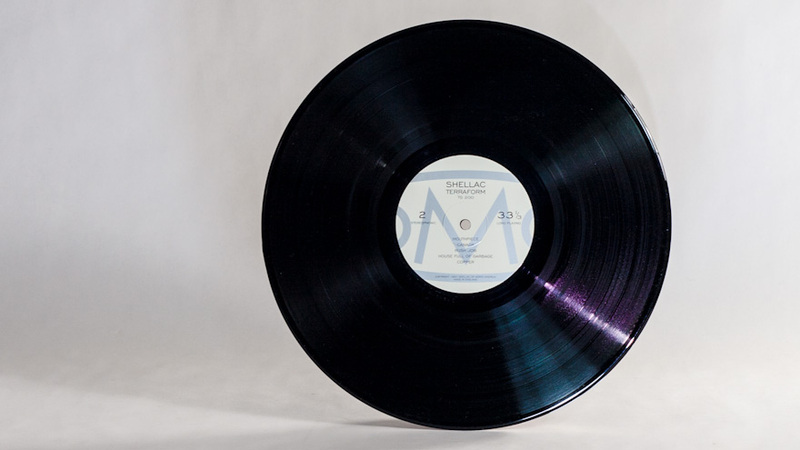 The LP had three extra spot colors printed. 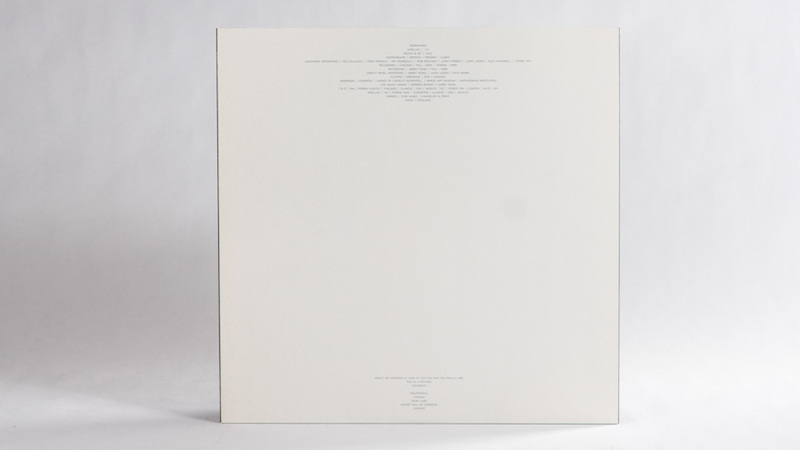 Back cover and inner sleeve photos by Bob Weston. 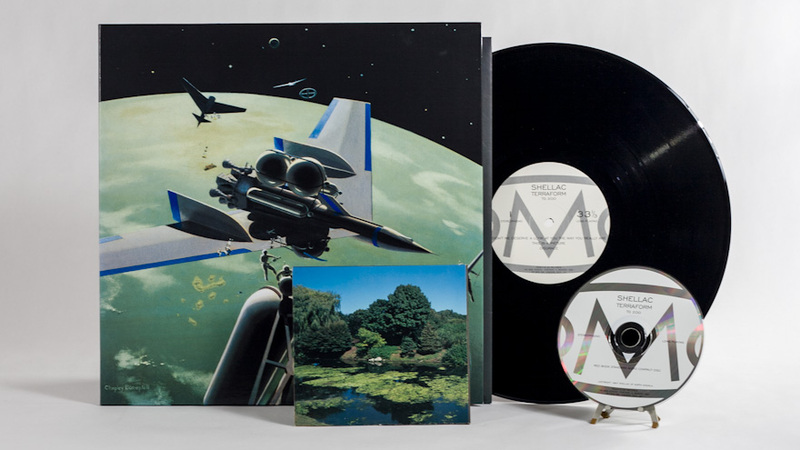 Steve had the idea to see if we could get permission to use some Chesley Bonestell paintings for the cover of our second album, Terraform. He is a big fan of Mr. Bonestell’s super cool science fiction spacescapes and planetscapes. After we picked out two for the cover and inside gatefold, we noticed that they suggested a sort of narrative. The cover painting shows some spaceships, astronauts, and a space station all at work in orbit around a planet. 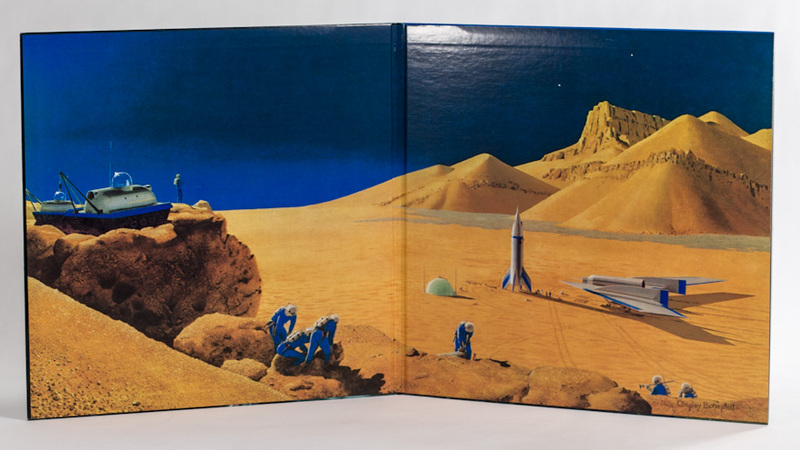 The panoramic gatefold painting shows a barren airless landscape with space-suited astronaut workers, rocket ships on the ground, a housing dome, and surface rover vehicles. The people look like they’re doing some sort of surveying or construction work. These two images suggested to us that this might be two views of a terraforming crew at work making an airless planet habitable to humans; terraforming it. As I recall, that’s how we stumbled upon the album title. It was suggested by the cover art. Around this time, I had been borrowing a friend’s 4×5 view camera to play around with. I think it was a reporter’s style Speed Graphic (made by Graflex); not a fine art view camera. Based on this new artwork concept of terraforming, I thought it would be cool to get a nice large format photo of a super lush springtime scene to continue the narrative of the cover art. This would show the planet after terraforming had been completed. 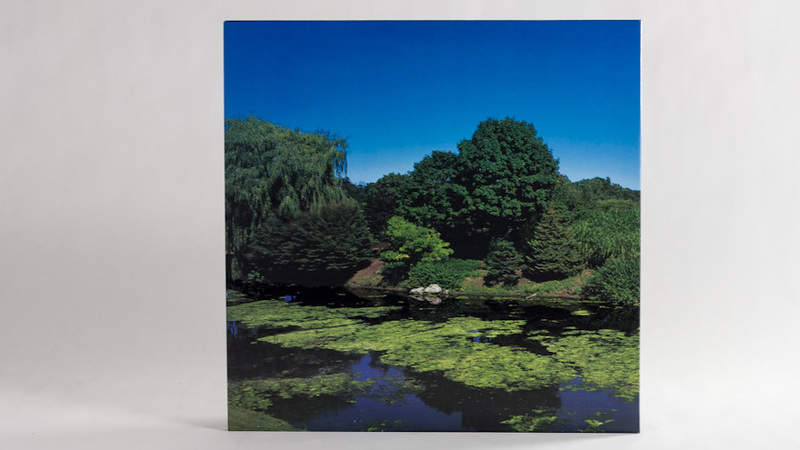 I waited for a nice day in the spring and drove up to the Chicago Botanical Gardens with Todd. We walked around looking for a good shot, and this one presented itself. I probably made only a few exposures on some Fujichrome sheet film. That’s the back cover. 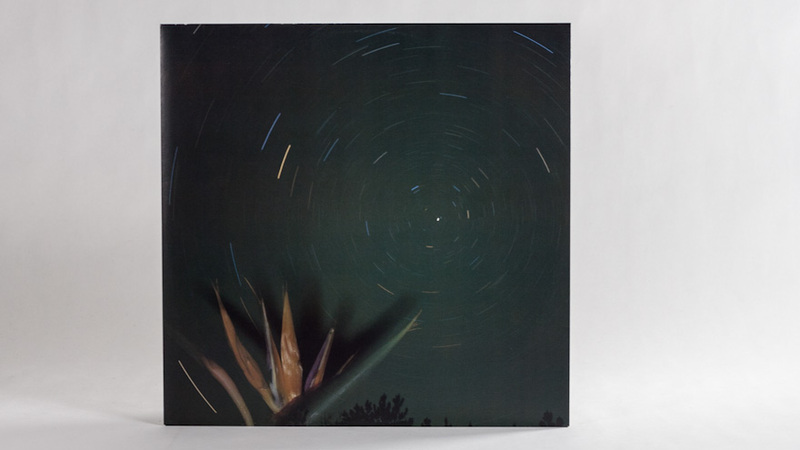 I had always wanted to make one of those photos where you do a long exposure at night and the stars all make trails around the North Star on the film as the earth moves through space. I pitched the idea of using a photo like this on the inner sleeve to Steve and Todd and they were up for it. Since we can’t see many stars in Chicago, I had to wait until I had a trip planned to a part of the country where I knew there would be a lot of stars visible. I was working on an album with my friend Eric Bachman of Archers of Loaf. It was an instrumental solo record of his where he went under the name Barry Black. We were going to mix it in Charlotte, NC, and so I brought the Speed Graphic along. One clear night we found a nice spot in a field, or maybe someone’s big backyard (I can’t quite remember) and set up the camera. I located Polaris and aimed the camera as best I could to be centered on that star. Then I cranked all the adjustment knobs on the tripod as tightly as I could so that the camera wouldn’t move during the long exposure. I really don’t remember how long I exposed the film, or what the lens aperture was set to. I probably had done a little research on it at the time. It seems like it was probably between one and two hours. I know that I was using Fujichrome film again. Todd and I both like the Bird of Paradise flower. So, I also had one of those on hand and somehow rigged it up to be in the frame, maybe 10 feet away from the camera. It was there for the entire long exposure to block light from the stars to its silhouette on the film. Just before closing the lens shutter to end the long exposure, I charged up a flash, aimed it at the flower, and shot it off so that the flower would show up in the photo. In retrospect, the positioning of the flash was my one big error. I probably held the flash off to one side, which caused a shadow shaped like the flower to appear next to the flower on the film. Had I set up the flash as close to the camera as possible, the shadow would have been more hidden behind the flower. The resulting positive image on the chrome film was my one and only try at this shot. Steve and Todd liked it enough that we used it.